Yesterday, an op-ed piece was printed in the Chicago Tribune that has gotten under my skin. It was about the California drought; I think the author was intending a little humor. I didn’t think it was funny. Humor at it’s best helps uncover the truth, and the author seemed to be pushing the truth that we can distance ourselves from the water crisis in California. But I think this little yuck- yuck is insidious at it’s heart. It presumes that we can segregate and regionalize our crises. “What happens in California doesn’t matter to me; I have plenty of water.” Pretty soon we’re extending the principle: “the mining of sand along the Mississippi River in Wisconsin doesn’t matter to me; I can’t see it from here” or “the oil spill in the (you name the river) doesn’t matter to me; I don’t live there.” As long as it’s not happening in my backyard, then I don’t need to be all that concerned about it. There are a few practical reasons why the drought in California should matter to us in the middle west. A disproportionate amount of fruits and vegetables come to our tables from California. A lot of what we eat and drink is at risk. If the drought persists, that supply will shrink and what is available will be much more expensive. 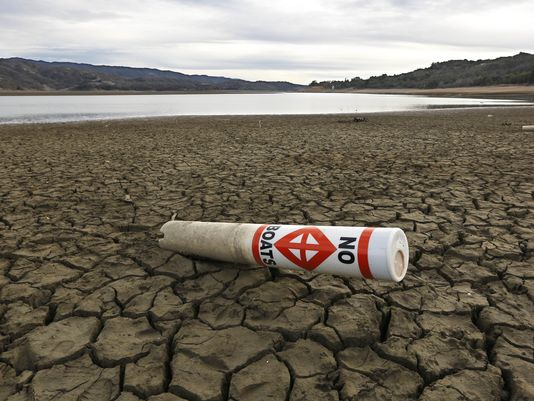 The water shortage is likely not going to go away, and neither are the almost 39 million people who live in the most populous state in the U.S. They will get water from somewhere, and as time goes on, it will come from further and further away. Climate change scientists are suggesting that what’s now happening in California is merely the pre-cursor to something that will be happening on a much larger scale in other parts of the country, including the middle west. Gloating over the abundance of water may be short-lived. But I think there’s something much more substantial at stake here. Something fundamental, spiritual, theological, if you will. We are all connected. We’re all in this together. The land that is California is the same as the land that is Illinois. It’s a single, unified creation. People identified as Californians are of the same human family as the people identified as Illinoisans. Whatever borders we create are artificial bureaucratic structures that create misleading divides among the family. When the middle west experiences abundant harvest, the plenty ripples far beyond the narrow Great Plains geography. And when creation is in travail in California or in The Philippines or at the Arctic Circle, then we all share that travail. Part of the stewardship of my life as a follower of Christ is the stewardship of creation, not just the little postage stamp that I live on, but all of it. The small things I do to conserve or waste inevitably have in impact on my brothers and sisters, not to mention the created order, around the world. We are all connected. Which means that my carelessness or wastefulness is stealing from the life of another. I learned something of the stewardship of the land from the farm families I grew up around. A good farmer doesn’t just steward the land that he can see from his kitchen window. He takes care of the whole of his farm, all thousand acres. And in fact, he cares for his own land in a way that he doesn’t cause harm to his neighbor and his 500 acres. And both he and his neighbor take care of their land in a way that benefits his neighbor’s neighbor and her 2000 acres, because they all know that while fences and legal documents define boundaries between his farm and his neighbor’s farm, it’s all the same land. For everyone to be cared for, all of it has be be cared for well. So, there’s no room to gloat over our abundance of water here in the backyard of Lake Michigan. Instead we ought to be caring for the abundance of that resource as if the California drought was ours. Because, after all, it is; we’re all connected. This entry was posted in Uncategorized and tagged california drought, stewardship of creation, we're all connected on April 8, 2015 by Jim Honig. Thanks, California Bob. This matter impacts you directly. And because it impacts you, it impacts me and all of us.